For this month's "Maps Of The Month" featurette, I wish to draw your attention to Maxim's Wonder Boy III: The Dragon's Trap (Master System) maps. Wonder Boy III: The Dragon's Trap begins with the final dungeon from the previous game, Wonder Boy In Monster Land. But this time, after the defeat of the MEKA (or Mecha) Dragon, our hero is transformed into a dragon - or rather, a "lizard-man" - and has to escape the collapsing castle, though he is no longer as strong as he once was. And so he goes off on another adventure, and along the way he takes on different animal forms - mouse-man, piranha-man, lion-man, and hawk-man - before returning to his "hu-man" form. This game is often considered one of the best Master System games - or even one of the best games of its generation, period. It's not hard to see why. The world is large and interconnected. The different animal forms, with different abilities, make revisiting areas interesting. With so much to explore (and re-explore), it would be quite handy to have some maps, so, you guessed it - our resident Sega fan, Maxim, gets a long-overdue Mapmaker Of The Month recognition for this gem in the Sega Master System library. 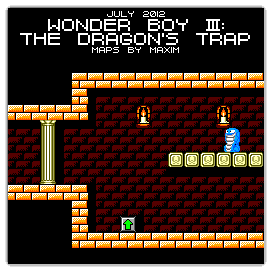 So to recognize the effort put into allowing us to escape the dragon's trap, Maxim's Wonder Boy III: The Dragon's Trap (Master System) maps will be known as VGMaps.com's Maps Of The Month for July 2012. Congrats! I particularly like the gradient transitions. I imagine those aren't in the game, but they look quite nice.